There is something about cheesecake and winter that I just love. Not that I don’t love cheesecake year round, but during the winter it is something that I really crave. It is so thick and rich and feels like a real indulgent treat. 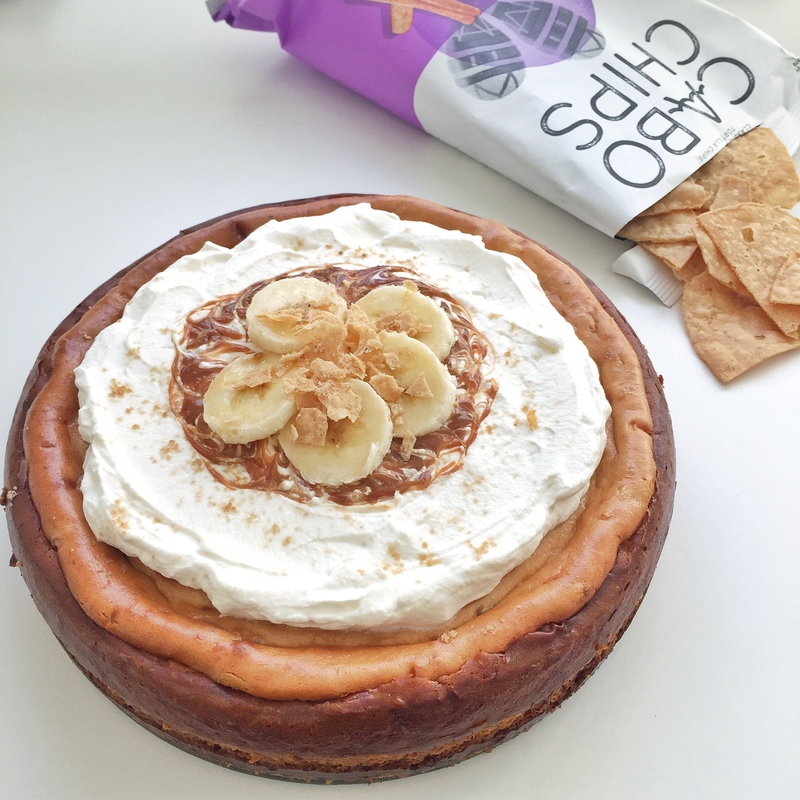 So with cheesecake on my mind I decided to have some fun with my new fave chips – Cabo Chips – since they came out with a churro flavor. 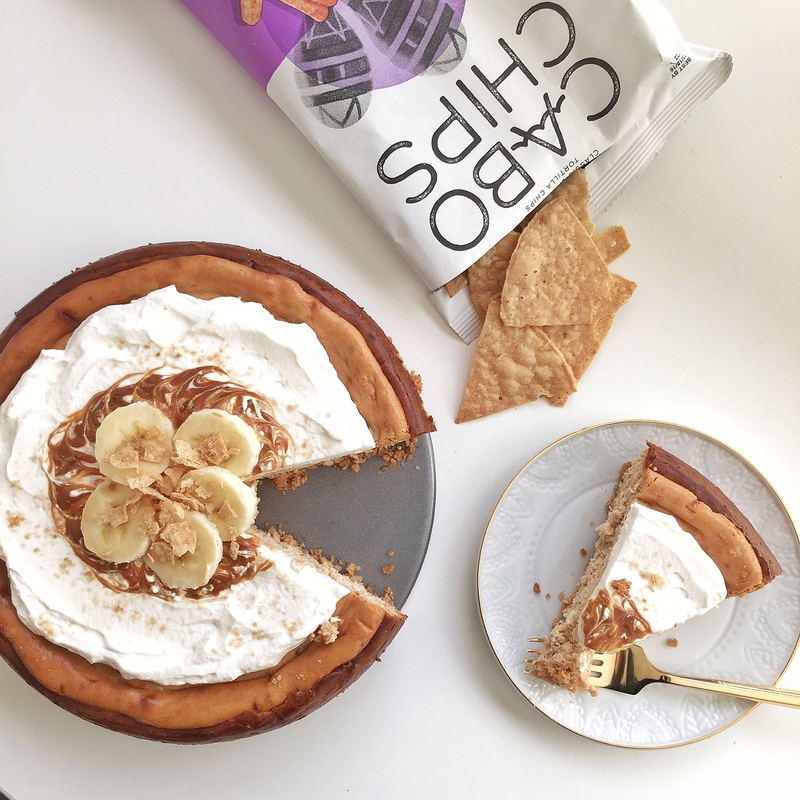 I ground up the Churo Cabo Chips like you would graham crackers for a crust. I added a little more cinnamon and a touch of brown sugar to really give the crust some oomph. More about the cheesecake + recipe and a discount code below so keep on reading! With a churro base I decided on a banana dulce de leche cheesecake. In no time I was in dessert heaven. The chip crust makes this cheesecake really unique it has more texture and crunch to it and really taste of churro from the combination of melted butter to bind it in the oven and natural fried oil flavor from the tortilla chip. Paired with the dulce de leche banana, it was a match made in heaven. Have some fun with your holiday baking and experiment with some chips in your dessert! Use this link bit.ly/1lrDxuF to receive $1 off each bag of Cabo Chips. Happy Baking! Preheat oven to 350°F. Coat a non-stick spring form pan with nonstick spray. In the bowl of a food processor pulse Churro Cabo Chips until finely ground. Mix ground churro chips, sugar, and cinnamon in medium bowl. Add melted butter; stir until coated. Transfer crumb mixture to pan. Press evenly onto bottom of pan. Bake until crust is light golden, about 10 minutes. Cool completely on rack. Blend cream cheese and sugar in processor until smooth and creamy, about 1 minute, stopping occasionally to scrape down sides of bowl. Add eggs 1 at a time, processing 3 to 5 seconds to blend between additions. Add dulce de leche and vanilla; process until blended, about 10 seconds. Fold in mashed bananas. Spread batter evenly over cooled crust. Bake until just set in center and edges are puffed and slightly cracked, about 38 minutes. Transfer to rack; cool completely. Heat dulce de leche and 1 tablespoon cream in microwave-safe bowl in 10-second intervals until melted. Stir to blend, adding more cream by teaspoonfuls if too thick to pour (amount of cream needed will depend on brand of dulce de leche). Using an electric hand mixer, whisk remaining heaving cream until stiff peaks form. Spread whipped cream evenly over center of cheesecake. Pour dulce de leche glaze over cooled cheesecake; spread evenly in center of whipped cream. Refrigerate until chilled, about 1 hour (glaze will not be firm). DO AHEAD: Can be made 2 days ahead. Cover; chill. When ready to serve decorate with sliced bananas and dust with a pinch of brown sugar over top. Hi there. I wasn’t sure you still had the blog. Glad to see you here. yes! from time to time. so good to hear from you! Wow this looks so amazing!